Sandy oh Sandy. As I’m writing this the lightening is flashing and the thunder is booming outside my apartment. 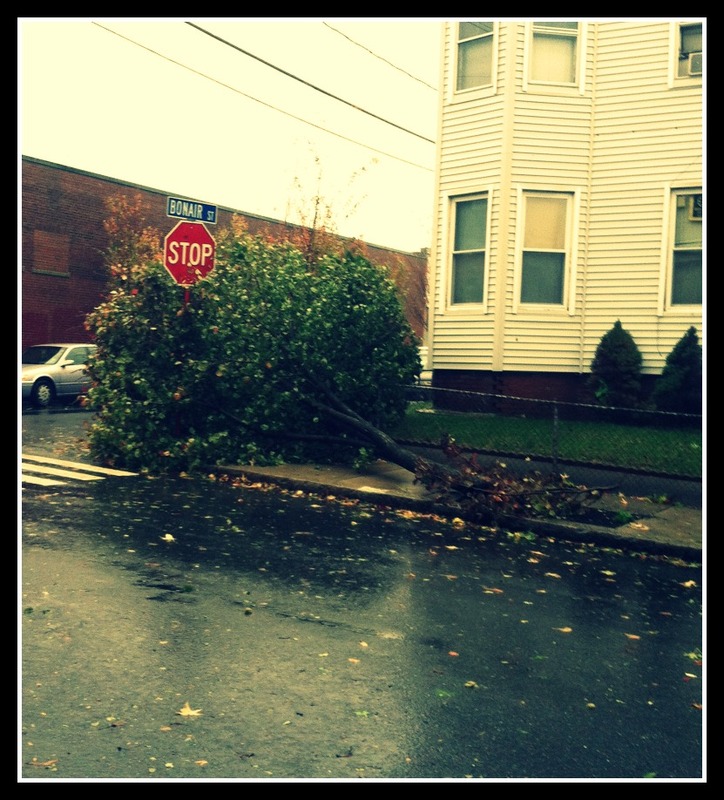 We were hit (more like open palmed slapped…half-heartedly) by Hurricane Sandy yesterday, and I figure this is some sort of aftershock-esque weather. I only had to work a half day at work because the T shut down at 2. But to be honest I was radiating with annoyance at having to go into work at all…there’s nothing I love better than a stormy day in my sweat pants. But whatever right? There are people with ACTUAL problems resulting from Sandy so I’ll stop being a jerk. this poor guy seems to be the only casualty on my street! Anyways…I’ve been meaning to post this for like 2 weeks. So I’m sharing it with you now. 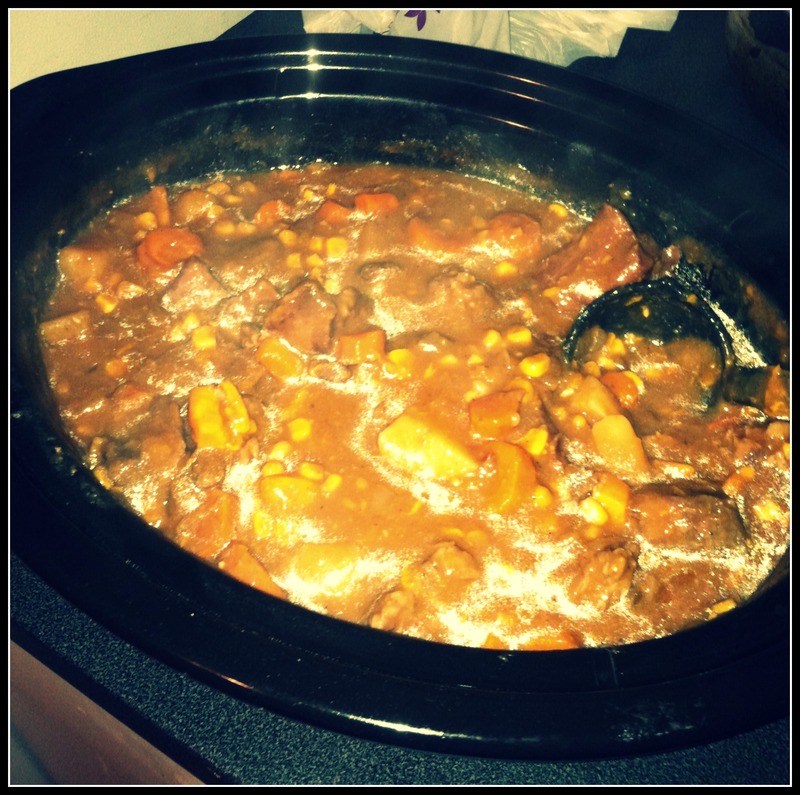 A few weeks ago I busted out the ‘ole crockpot and whipped up some Beef Stew. As I’ve mentioned before in other posts I’m really not a soup person; it’s just not my jam generally. But I wanted to branch out and give it a go…partly because the weather turned arctic…remember that week? brrrrrr! 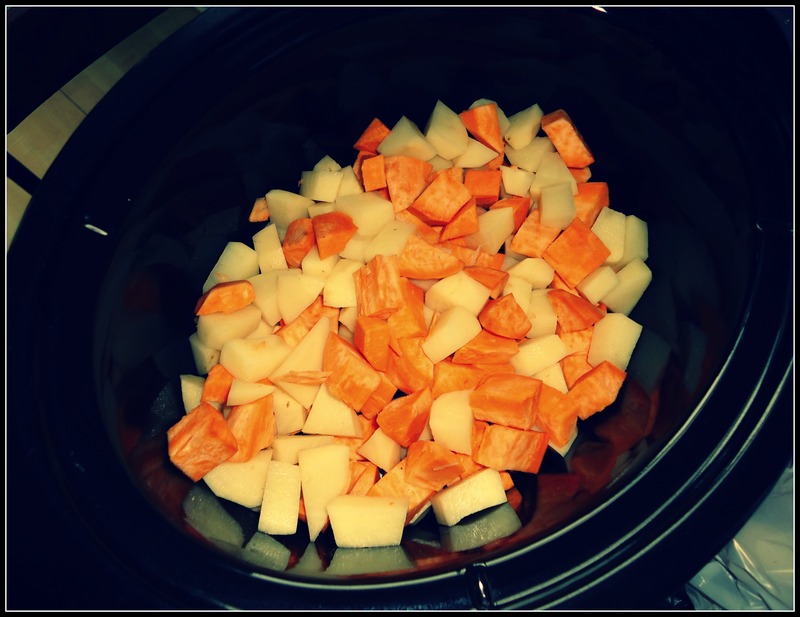 Layer potatoes on the bottom of your crock pot. Next, layer carrots on top of potatoes. 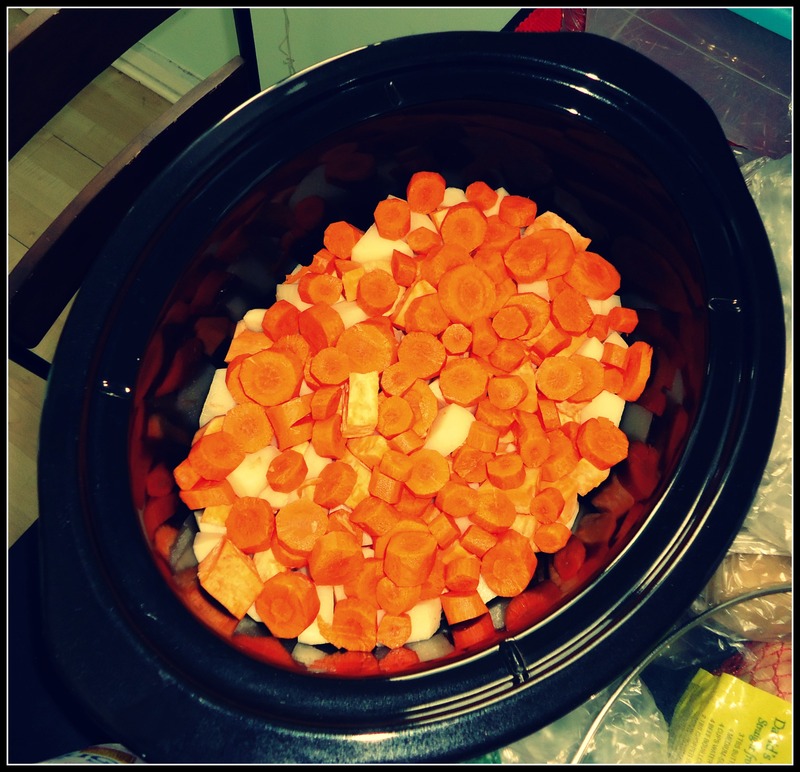 Place meat on top of carrots. 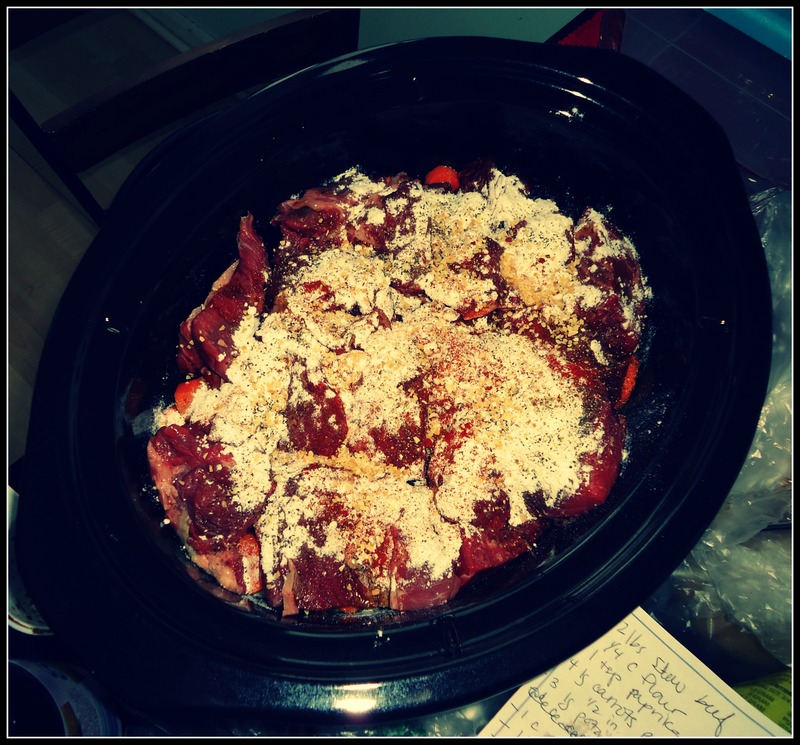 Sprinkle meat with soy sauce, salt, paprika, pepper & flour. 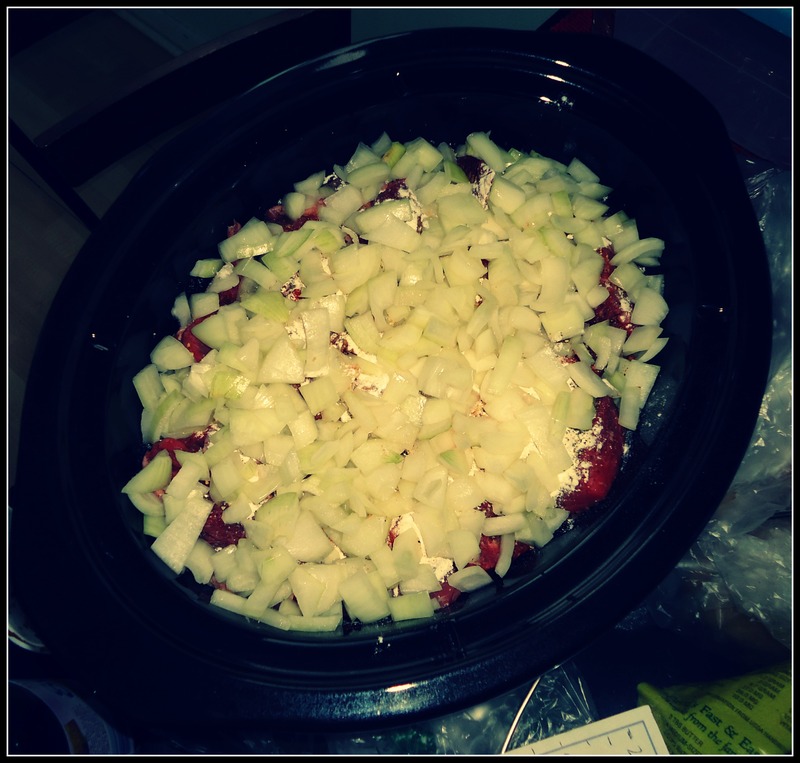 Layer chopped onions evenly on top of sauce/seasonings. 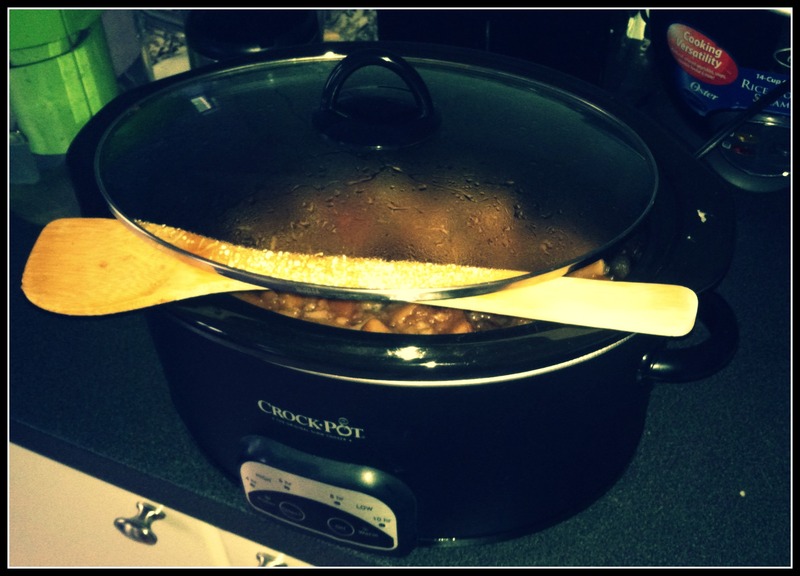 Combine beef broth & tomato sauce and pour over everything in the crock pot. 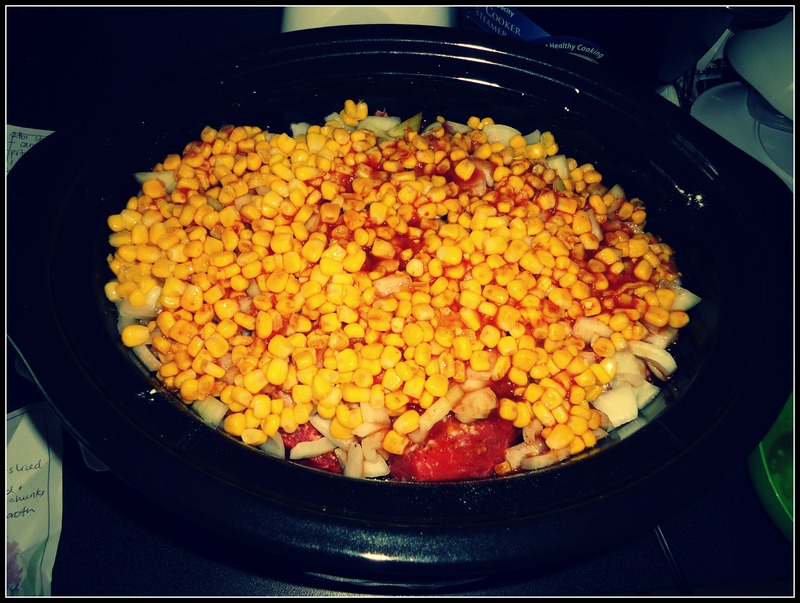 Now I changed it up a bit to suit my tastes…I added canned corn and a sweet potato as well. This is an easy recipe for putting the freezer for later cooking, or just feeding yourself slash your family. I think it’s a good one to keep in your arsenal for this winter! 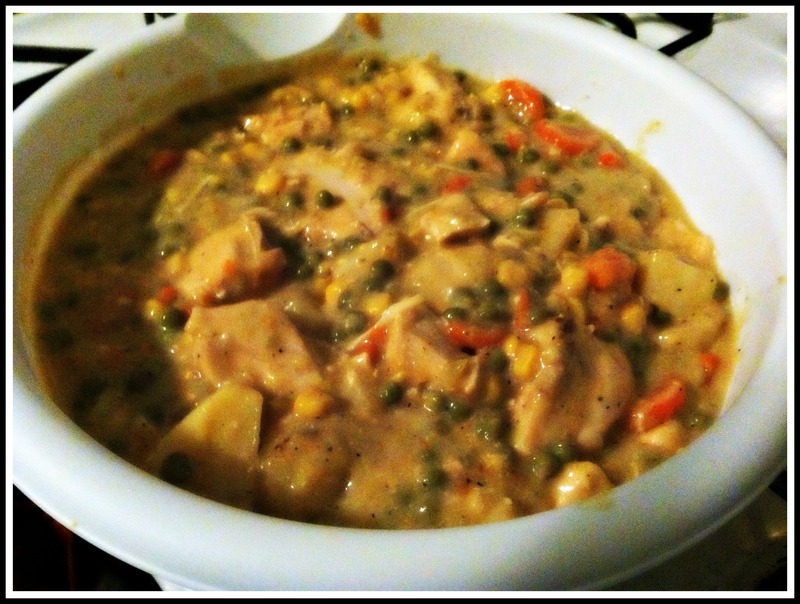 Crockpot Chicken Pot Pie…Yes Please! True story: I love chicken pot pie. Let’s be serious here people, what’s NOT to love about it? Answer: nothing. So obviously when I came across an opportunity to combine my love of chicken pot pie with my love of crockpots…BOOM…it was a big lovefest. Its actually super easy to whip up…and is perfect for this chilly (sometimes freezing) fall weather. 1. 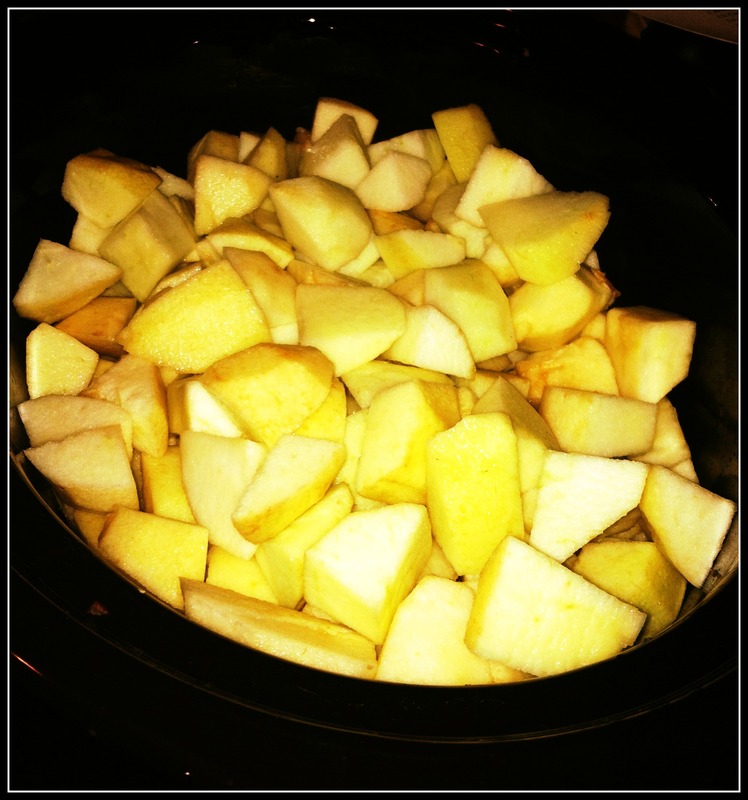 Fill the bottom of the crock pot with boneless chicken thighs and potatoes. 2. Pour a can of cream of chicken, cream of celery and cream of broccoli soup over the chicken and potatoes. 3. Cover. Cook for 6 hrs on low. 4. Add a can of corn, carrots, green beans and peas and cook for 45 min longer on low. 5. 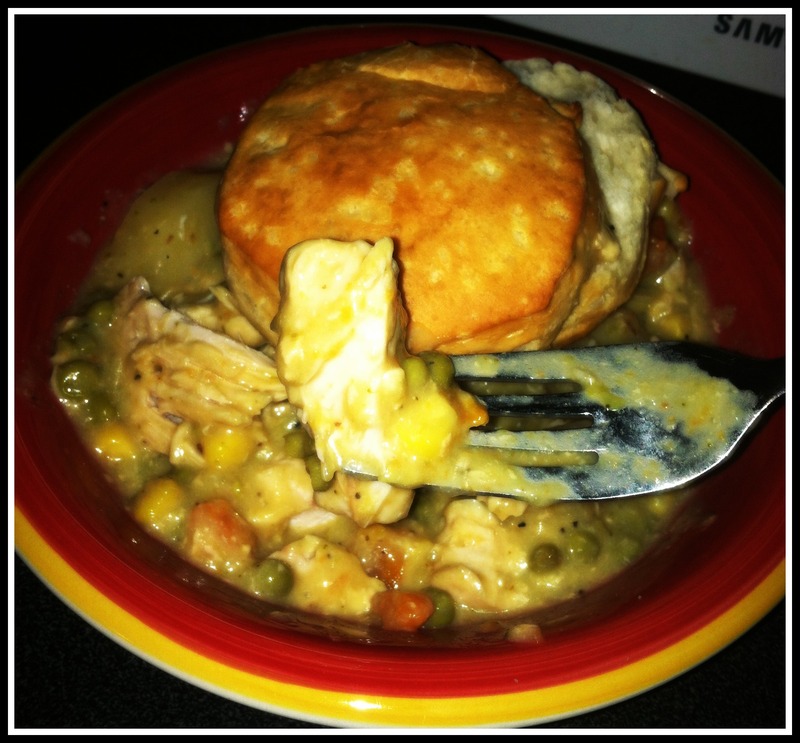 Make biscuits in the oven and scoop pot pie on top of biscuits. Apples apples and more apples. That has been my life for like 2 weeks. 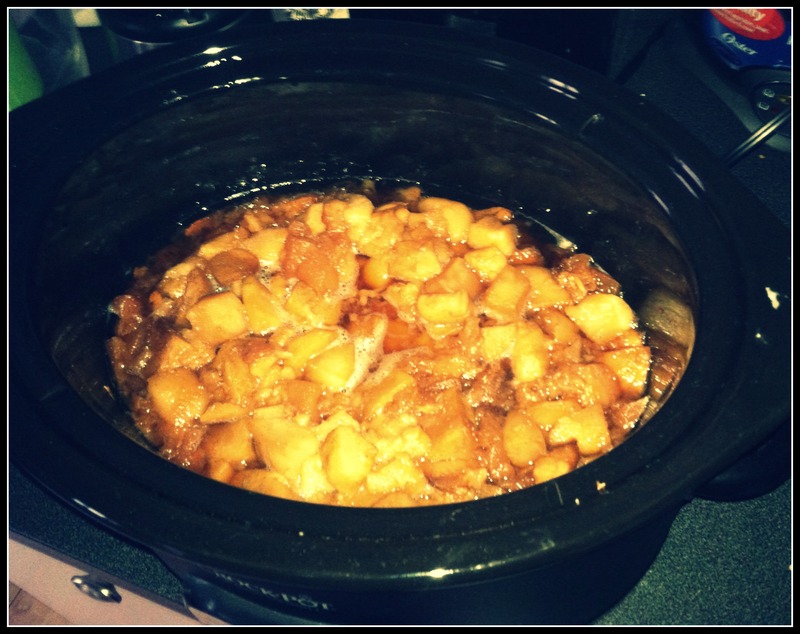 But in my recent post I told you that I made Apple Butter in my crockpot. I’ll be honest with you. 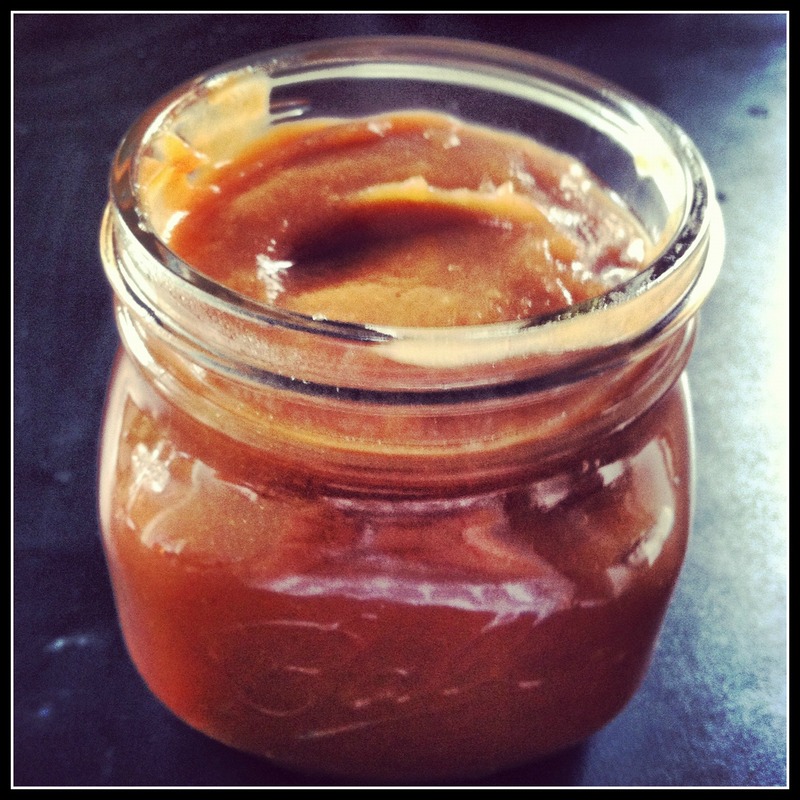 I had NO idea what apple butter was, what it looked like, what it tasted like, or what the what you did with it. But friends and the internet said good things so I figured hey why not? It is a bit of a process so it works best as a weekend thing. Start by peeling, coring and chopping about a dozen apples. Then toss them in your crockpot. 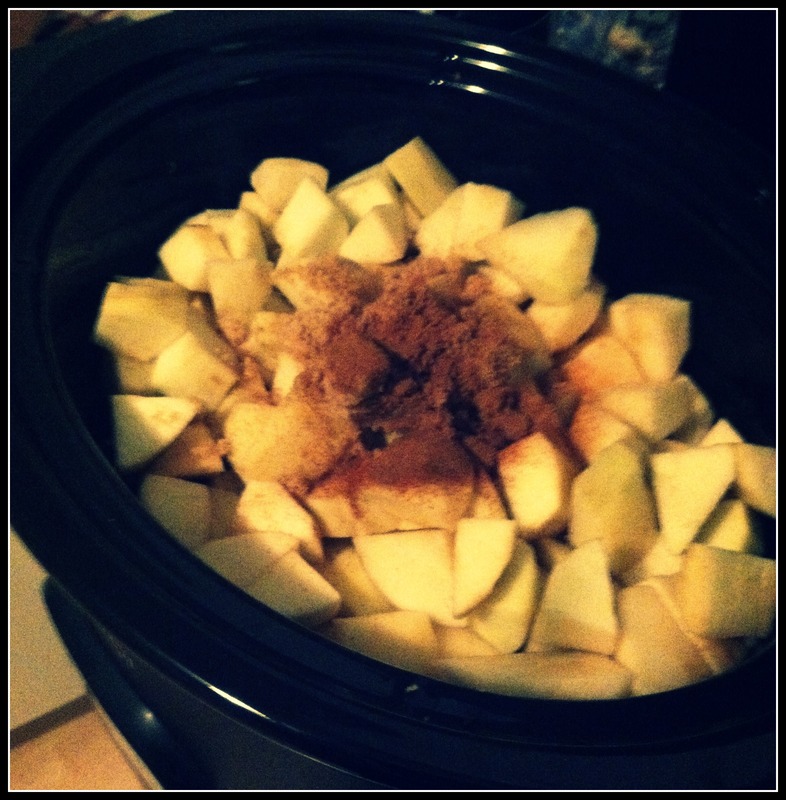 Next add 1/4 c brown sugar and cinnamon (I used like 1.5 Tbs) and 1/2c water. 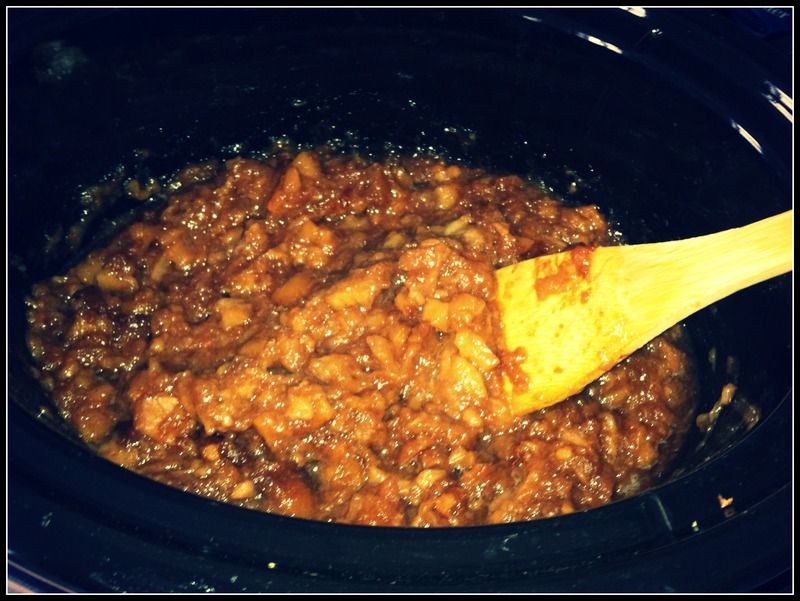 Set your crockpot on low and cook for about 10 hours (overnight works best time wise). In the morning you have this! Then use a wooden spoon to prop the cover open and cook on high for around 4 more hours. After around 4 hours the water cooks off so you have this tasty mess. You can leave it like this, or you can use a Magic Bullet or Immersion Blender to smooth it out. I happen to have both so I opted for smooth. I divided my batch in half. I filled this adorable mason jar and put it in my fridge, and filled a tupperware container and stuck it in my freezer for later. Its really tasty stuff. It also makes for great holiday gifts come Christmas time.